For the vast majority of employees at PCC, discipline is an issue that never comes up. But what if you suddenly find yourself under the microscope? What if your supervisor asks you to attend a meeting and you get the feeling you could be “in trouble”? The PCC administration maintains that a manager, in consultation with HR, can decide independently whether any action, such as an MOE, is disciplinary, and as long as that action is not specifically called out in Article 22, then you have no right to representation during any conversation about your employment or working conditions. We disagree! Note that the scope of your Weingarten rights is broad: you have a right to have a union rep present if the conversation could in any way lead to discipline OR lead to a change in your working conditions. What we’ve noticed over the years is that HR seems to be running a shadow disciplinary system which relies on the MOE. As long as it’s “just an MOE,” they are effectively saying, then “whatever we do is NOT disciplinary and the union has no right to be involved.” But if you’ve ever been subjected to the MOE process at PCC, you’ve probably felt it was pretty punitive. And if an MOE says that it could serve as the basis for future discipline, then that MOE, we contend, *is* disciplinary, in which case you have a right to union representation during any part of the process. If you have a good relationship with your supervisor and you feel comfortable talking about your work, then you probably have nothing to worry about. But if you are having a conversation with a supervisor and you feel the conversation is starting to stray into uncomfortable territory—especially about things you are doing that are unsatisfactory (or you are NOT doing what you’re supposed to be doing) and what might happen if you don’t correct your behavior—then you should stop the conversation and say you’ll resume the conversation once your union rep is present. Your supervisor can always spell out expectations, but when things start to feel “formal,” consider invoking your Weingarten rights—especially if the magic words “Memorandum of Expectations” are communicated at any point. You CANNOT be disciplined for invoking your Weingarten rights or any union rights. These rights are protected under the law, and the employer will get in serious trouble for stopping you from exercising them. One reason we’re so concerned about the MOE “shadow disciplinary process” at PCC is that MOEs have been used in place of the disciplinary process that the PCC administration agreed to follow, and just because an employee was given an MOE, this did NOT stop the employee from being dismissed (fired). We have a case going to arbitration soon that will make this very point—that PCC administration did NOT follow the disciplinary process; they moved from an MOE directly to dismissal, without establishing just cause and without following progressive discipline. If you have any questions or concerns, please contact anyone on your Executive Council or give your Federation office a call at x4178 or x4180. On Monday, the U.S. Supreme Court will hear arguments in the Janus v. AFSCME case. The Court will likely find that unions such as ours need to represent all employees whether or not they pay for that representation. If the Court finds against us, we will continue to negotiate contracts (like the re-opener that added two new steps for part-time faculty in September 2017), organize events (like our recent trip to the Oregon Food Bank) represent members in grievances (we’ve represented dozens of members in grievances in the last year), or just help answer questions about our contract. But… we’ll do it with less financial support from the nearly 2000 faculty and academic professionals whom we represent. We’ll keep working and fighting for fair treatment on the job. Unions won gains—like the weekend in 1937 —long before “fair share” dues became part of labor law in 1977. The Janus case will likely completely flip this Abood precedent of fair share dues. But it will mean we need more help from all of you. More help talking to members. More help organizing activities. More help writing emails like this one—which is drafted by ten members of our union in their “free” time. For now, what can you do to help? Confirm your membership— If you would like to activate, or just confirm, your membership, you can fill out a membership organization form online here. Keep engaged—you can read AFT’s amicus brief or check out news coverage. Let your colleagues know why you value being part of a union. If you’re not sure if you’re a member—or why you’re a member, write back. Ask an Executive Council member on your campus. We want to talk to you—not just about what we’ve done, but what we can do now and in the future. In other news, please check out the PCCFFAP website for a guest blog from a part-time faculty member and other updates. And don’t forget to sign up or nominate a colleague to attend the annual AFT-Oregon Convention. Click here for more details. Join Us at the AFT-Oregon Annual Convention! We are looking for interested PCCFFAP members to participate in our upcoming state AFT-Oregon annual convention. This event is a great opportunity to learn more about the work of our union, help define our union priorities, and meet union supporters from around the state. If you’ve been looking for an opportunity to become more involved in the work of our federation, please consider attending. We plan to send a large delegation of 20-30 members. Following convention, all delegates will be asked to briefly report what they learned and action items that may be taken by our local. Please email heidi.edwards@pccffap.org no later than March 11th if you are interested or have questions. PCC’s mission is accomplished at the edges of the organization, when students succeed in classes. 62% of class sections are taught by PTF across our primary campuses. PCC’s foremost opportunity to positively impact equity in student success comes where students spend the most time; in classes taught by part-time faculty. Part-time faculty, whose contributions to equitable student learning opportunities and experiences seem unrecognized in the district. This group has a primary set of responsibilities in delivering on PCC’s mission. They are underpaid, under-supported, under-recognized, under-benefited, and have limited mobility and advancement opportunities. They are not treated equitably. Yet, the successful path to equitable student success goes right through the classroom, though the current campaign seems to be starting elsewhere. 1) The mission of PCC is realized at the edges, where educational opportunity lives, where students and instructors meet. 2) Part-time faculty teach most class hours. Most of students’ educational experience at PCC experience is with PTF. 3) Part-time faculty are in less-equitable employment circumstances than any other class of employees. Our pay is low, our employment is at risk, and most of us don’t receive benefits. Earning below a living wage and income insecurity is a difficult situation for many. 4) When better supported and motivated, part-time faculty can have the biggest impact in improving on the delivery of PCC’s mission. PCC seems to regard PTF as a regulated workforce to be administered and negotiated to preserve the financial status quo. The administration doesn’t seem to see that PTFs’ concerns for equitable employment reflect the greatest opportunity for PCC’s success. Part-time faculty: Inequitable employment. PCC’s best resource and opportunity to positively influence equitable student success. Is there a topic you’d like to see covered on the PCCFFAP website? Are you interested in submitting a guest blog post? Contact VP for Communications Michelle DuBarry at michelle.dubarry@pccffap.org. Presentation and Discussion with Bill Fletcher, Jr.
Bill Fletcher, Jr. has been at the forefront of both the labor and anti-racist movements for four decades. Fletcher has served as Education Director for the national AFL-CIO and as senior staff for a number of national labor unions. He has also served as president of TransAfrica Forum, as Senior Scholar with the Institute for Policy Studies, and as an editorial board member of BlackCommentator.com. He is author or co-author of multiple books, including Solidarity Divided: The Crisis in Organized Labor and a New Path Toward Social Justice (University of California press, 2009). 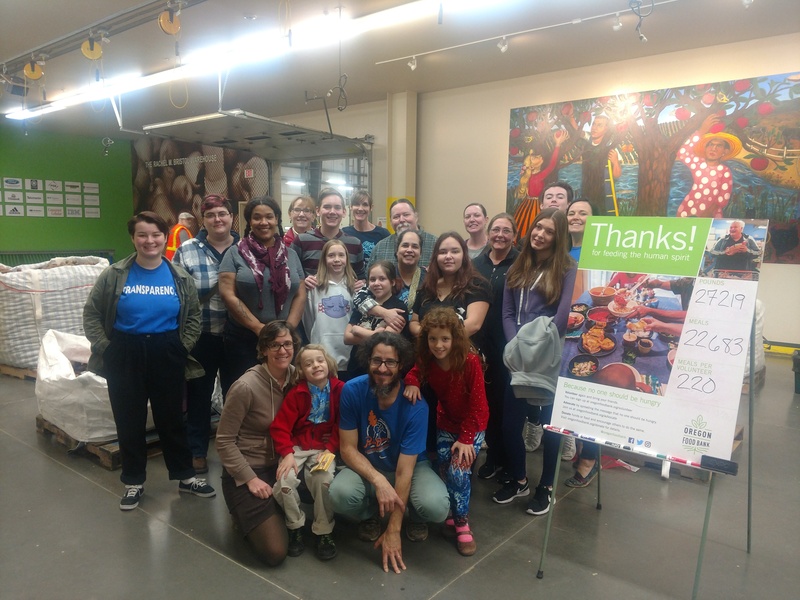 On February 10, members of PCCFFAP and PCCFCE came together to volunteer at the Oregon Food Bank. We learned a lot about food insecurity in Oregon and how we can make a difference in our community through volunteer efforts. Along with packing potatoes, many of us participated in Oregon Food Bank’s postcard campaign by signing postcards that will be sent to our congressional representatives to advocate for continued funding for SNAP benefits. It was great to see union members showing solidarity and helping to fight hunger and food insecurity in our community. Between negotiation sessions, a Federation team meets monthly with the administration to discuss contract issues as they arise. The hope is to prevent issues from piling up between the official bargaining every two years. These are called “Contract Administration Meetings.” (CAM, for PCC acronym collectors!) The Federation Grievance Committee tracks problems we hear from members, and meet before CAM to prioritize the issues and plan strategy for bringing our members’ concerns forward. The administration team also adds items, and the agenda reflects the concerns of both teams. Bargaining over wages and benefits took longer than usual in 2017 – at least in part because the administration team was willing to put a good deal of research and thought into the Federation request for equal pay for equal work. But that means our first CAM of 2017-18 wasn’t held until February 2018. Our Grievance Committee voted to put delivery of a report on the “students of concern” process as it impacts “part-time” faculty as our highest priority for CAM. 294 instructors responded to a survey sent in Spring 2017 asking about their familiarity with the process for reporting concerns with student behavior, and any experiences they had from using it. We then conducted in-depth follow-up interviews over the summer. A draft of the report was widely circulated for comments during Fall 2017. The final report was presented to the administration at the February CAM. You can read it here. As background, since the Umpqua Community College shooting in 2015, administrators in community colleges have taken extra steps to address the question “could that happen here?” At PCC, 4 new Academic Professional positions were created — the student conduct and retention coordinators — and the process for reporting “students of concern” was revised and streamlined. Training has been held at inservice events and through the TLCs to help familiarize faculty and academic professionals with the process. Since campus safety is a shared concern, Federation leaders have applauded these measures. But many “part-time” members contacted the Federation, asking for help, over the past two years. We discovered that the lack of onboarding for “part-time” instructors, their marginalization in faculty committees, and pervasive insecurity about future employment meant that the measures the administration had put in place were not adequate to keep us safe. Concerns were presented at nearly every CAM session since Winter 2016. Our concerns did not lead to any changes, however. So we decided to devote many, many hours to the survey and interview process, to document the problem. We believe our survey shows problems that present serious threats to the safety of all PCC students and staff. In a time of “evidence-based educational practice” and President Mitsui’s desire to make PCC a “learning organization,” we hoped our report would be received with an open mind by the administration team. That did not happen. The administration team was — to quote the descriptors used by members of the Federation team who were present — belittling, disrespectful, dismissive, and condescending. The report documents the pervasive trepidation “part-time” instructors feel at voicing their sense of unsafety and concern “out of fear of repercussions from the administration” (to quote a response to our survey). The administration response to the presentation of our report was a dramatic display of the very kind of concern documented in our report. It was as if the administration wanted to punish any “part-time” employee who dared to question DOIs and Division Deans by being sure to put us back in our place. We take the tone of the administration response to itself be evidence of the findings of our survey. A counter-claim: the Administration has successfully created a “culture of reporting” at PCC. No evidence was given for the counterclaim. We believe the survey shows the administration team is simply mistaken about the success of their work, at least as it relates to the majority faculty. The administration has made a wonderful start, which we applaud. But there is major work left to do to ensure staff and student safety. Several Federation team members said they believed the behavior of one of the administrators in CAM amounted to bullying. We also heard from many people who made the time to attend bargaining sessions over the summer that they believed the administration team were disrespectful and bullying toward members of the Federation team. We will be consulting experts on bullying in the workplace before the next CAM and negotiations to try to ensure the important work done stays mutually respectful. The teacher of the Umpqua Community College class who was killed, along with 8 students, was reported to be an “adjunct.” I do not believe that it would be an adequate consolation to the families of the dead that the administration had offered an optional training which the teacher had failed to attend. Safety is a mutual obligation. We must all do our part. The part of the administration is to design and implement a system of training and support for the majority instructors that they are not afraid to use, lest there be employment repercussions. a review of the current practices relating to students who threaten faculty members, a problem brought forward by two “full-time”faculty. The administration team was respectful and agreed to look into making changes. a long and stalemated conversation about the scope of Weingarten Rights, which guarantee Union representation when discipline is possible. We need to find a way to make these meetings more consistently collaborative and productive. A start would be an agreement to treat each other with respect — just a little bit.